Vintage fans talk a lot about Koufax and Drysdale, but why do so few outside of Cincinnati know Maloney? A peek inside his career numbers says a lot about the importance of playing for winning franchises. 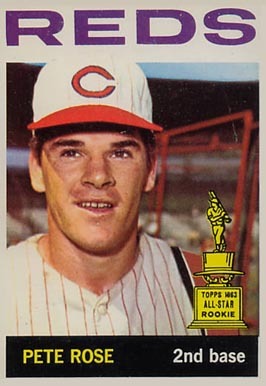 Maloney won 15+ every year from 1963-68 (and 20+ twice), averaging over 200 Ks annually for good measure. 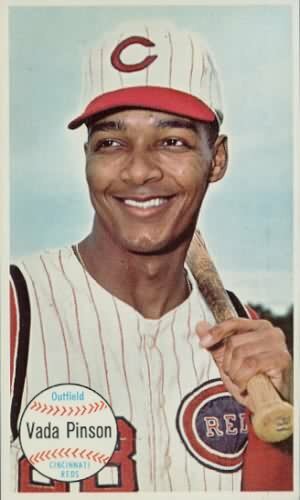 Unfortunately, Cincy finished 5th, 2nd, 4th, 7th, 4th, and 4th in the NL during that span, so fans know Sandy Koufax (LA won four pennants that decade) and Bob Gibson (StL also won four) as the prototypical 1960s aces, thanks in part to recurring post-season appearances and success. Maloney led the NL in strikeout rate for 1963 (9.5 per nine innings), but finished 2nd to Koufax in wins and Ks by making seven less starts and pitching 60 fewer innings. 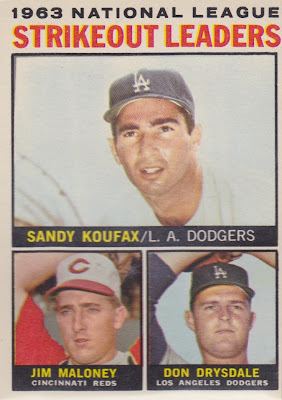 Note that Koufax won both the MVP and Cy Young awards that year. Given an equal 40 trips to the hill, I think Jim would've pushed Sandy for the Cy Young and diverted many MVP voters to a top hitter, like Hank Aaron or Willie Mays. TRIVIA: 1963's top 25 MVP vote-getters included seven pitchers and three Dodgers: Koufax (1st), Perranoski (4th), and Drysdale (21st). Maloney finished 19th and appeared in the fewest games of anyone receiving votes. 1964's white borders and block letters look "clean," which is a nice way of saying "kinda dull." A few, like #125 All-Star Rookie Pete Rose, stand out for their youthful enthusiasm, but many just take up space in the binder. 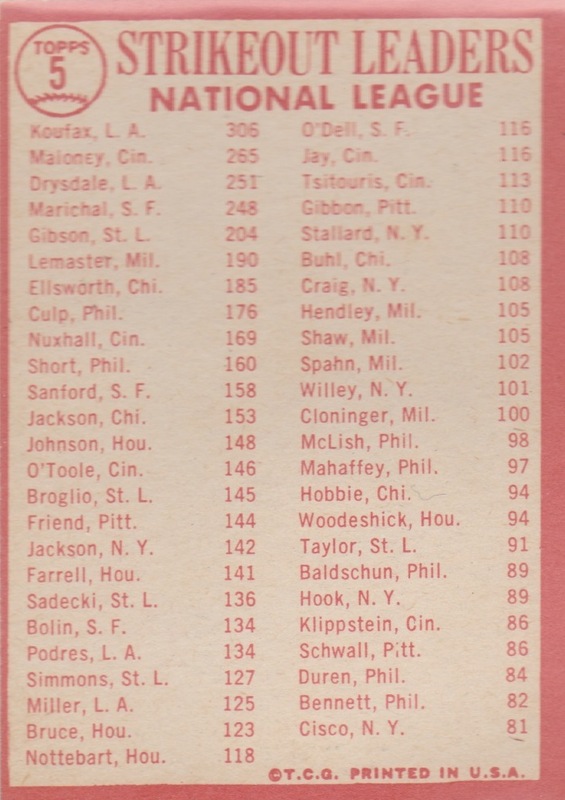 If you're a big fan of high-quality, engaging photos from the same year, check out 1964 Topps Giants instead (#5 type profile). Any big fans of the regular set want to rise to its defense? I suppose it's better than 1969's omnipresent airbrushing, but a step back from 1962's wood grain and 1963's bright colors and multi-photo fronts. 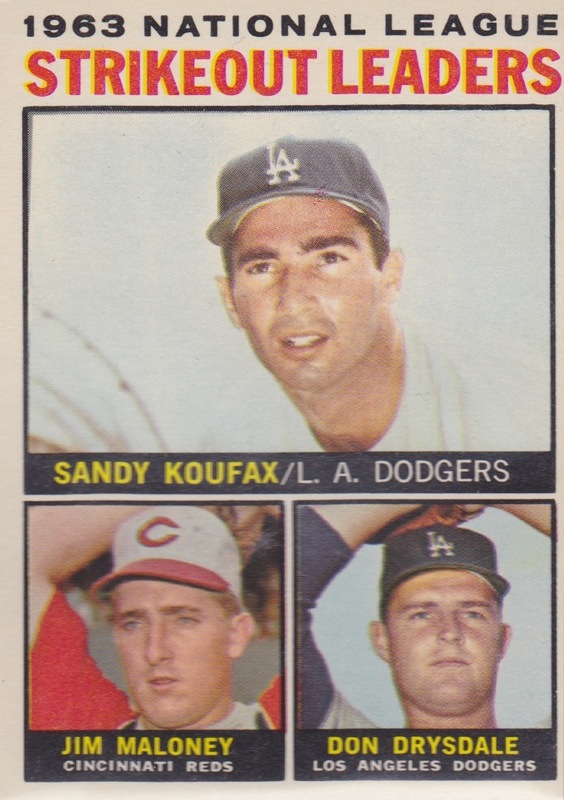 Fakes / reprints: Topps will use 1964's base design for next year's Heritage set. 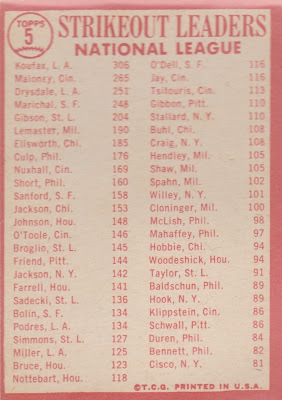 Since those mid-60s salad days, our sport's grown from 20 to 30 teams, expanded from two to six divisions, and added three playoff series per league, but it's still the same company making cards!